Walking with Jesus: Day 77: Acts 22:30-23:11 & Prov. 25:11-19 - What is our Source of Courage? Day 77: Acts 22:30-23:11 & Prov. 25:11-19 - What is our Source of Courage? In today's reading, we see some chinks in the armor of the Apostle Paul. When he gets to his trial in front of the Sanhedrin, it's clear that he isn't going to be granted a fair hearing. After he speaks a single sentence, he is struck on the mouth. Then, things get really chaotic. Paul cries out in anger against the high priest, which he retracts once he realizes who he is. Then, he takes advantage of a divided council by declaring his allegiance to the Pharisee party and his hope in the resurrection. Overall, Paul's actions seem to arise from panic and emotion rather than cool reason, and his actions result in a chaotic and violent argument. Paul himself is in danger of being torn in pieces before the tribune once again steps in to save his life. Paul owes much to this brave and noble tribune. Yet it seems like his efforts to proclaim the Gospel in Jerusalem have been an utter failure. This is why it's so surprising when Jesus comes to Paul the next night and says, “Take courage, for as you have testified to the facts about me in Jerusalem, so you must testify also in Rome.” Paul might have been feeling like he had blown his one decent chance to gain a hearing for the Gospel among the rulers of his people. Jesus sees things differently. Paul has testified in Athens, the intellectual capital of the Roman Empire. He has now also testified in Jerusalem, the spiritual capital for God's people. The next place for Paul to go is to Rome. But how can Paul take courage? He has had some success, but arguably just as many failures. Certainly his time in Jerusalem was a failure. But that's not God's way of thinking. Paul cannot take courage from his eloquence or persuasiveness or from his results. God is the One who saves and He does so as the Lord God, not in response to how "good" someone is at "selling" the Gospel. Where does the Christian get courage? Not from our own abilities or our own results. Ultimately, neither our abilities nor our results are our own. They come from God, and so does our courage. 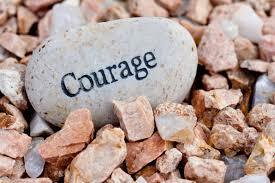 Our courage comes from knowing that we belong to the Lord and He uses us as He sees fit. We are to be faithful to His call, by His gracious power, and leave the rest in His hands. Not stressing about our own abilities or the results of our ministry frees us to take courage in the Lord! Heavenly Father, we are Yours and Yours alone. You have created us and You have redeemed us by Your power for Your glory. Your kingdom is indeed Your kingdom, not ours. Salvation belongs to You alone. Use us as You would see fit, and may we always draw every ounce of our courage from belonging only and always to You! In Jesus' name, Amen. Heavenly Father, make us Your ambassadors, faithful and true. Let us speak Your word, which is always fitting, and to be wise and gracious in our words always. Lord, grant us patience and gentleness, the fruit of Your Spirit. Give us also contentment and gratitude, that we might not be looking with coveting eyes on our neighbors. Let us speak the truth and do so in love always. In Jesus' name we pray, Amen.